This TV was flashing a 2 blink code which is a power supply error. A service and training manual can be found here. Power supply board part number is APS-299 (1-474-303-11 147430311). 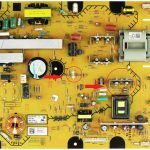 Searching on ebay found repair services and repair kits for this board. Posts on badcaps indicated potential shorted transistors Q6101, Q6102 and open resistor R6540. When i tested these parts, all three had failed. Q6101 and Q6102 are shown in the schematic as TK5A50D. These are 500V, 5A N-Channel MOSFETS. I had FDPF7N50U (Digikey #FDPF7N50U-G-ND) spares from a previous repair. R6540 is listed as a 0.1 ohm 1/2W resistor and I temporarily substituted the part with a 0.47 ohm 1/2W fusible resistor I also had. 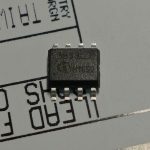 Digikey substitute would be 0.1DMCT-ND (0.1 ohm, 2W fusible). With these 3 components replaced, the TV powered up. This failure is similar to a previous repair on a Sony KDL-46EX400 here. This video describes repair of a 2 blink code on a KDL-46EX523. The boards are very similar but the designators and transistors are different.